Even though mold is a part of the natural environment, finding it in your home or building can be very troublesome because it can cause property damage as well as serious health effects from extensive exposure. Moisture is the main cause of indoor mold growth so if you have dealt with indoor flooding, a broken pipe, or some other form of water damage, you are at a much higher risk of experiencing mold growth. ServiceMaster by Rice provides mold remediation services in Des Moines, IA to safely remove mold contaminations from homes and businesses. As soon as you notice mold growth, make sure to call us to stop its spread and locate any hidden mold. Sudden health problems among family members such as headaches, respiratory issues, and other allergic reactions associated with exposure to mold. 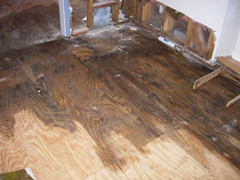 Do not attempt to remove mold growth: Trying to clean up mold growth can cause it to release its spores which will result in a much bigger problem. Take notice of all potential signs of mold growth: Ignoring signs that you may have mold growth can be dangerous as it will allow the mold to spread further. Call ServiceMaster by Rice immediately if you discover mold growth. If you find mold growth in your home or building or have reason to believe that there may be hidden mold growth, contact ServiceMaster by Rice for mold remediation services. Our technicians are trained and certified to handle all levels of mold contamination and our testing capabilities allow us to find and remove hidden mold growth. You can reach us 24 hours a day at (515) 212-2511 to learn more about our mold remediation services in Des Moines, IA.